Wind storms, snow storms, thunderstorms, flooding: All are disasters that can bring down large branches or whole trees where you will need emergency tree services. 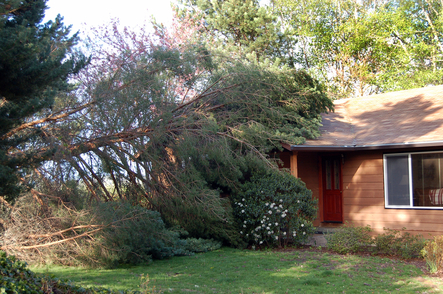 Storm damaged trees or branches can be removed, but it becomes an emergency that we can respond to anytime 24/7 when one has fallen and damaged your house or business, has blocked your driveway or other access road, or has fallen on a car. Call us immediately at 410-793-1013. Our emergency tree surgeons have all the skills, training and certifications to be able to properly respond to these emergencies and have done so many times in the past. Frequently, when one person is having an emergency, a number of other people are as well because the same storm affected a wide area and we will have multiple calls for emergency tree removal. Once the emergency is under control at your location, we will probably have to run to the next house or business. However, we can come back to do emergency tree care for storm damaged trees and shrubs. Next we will take care of issues such as cleaning up yard waste of lots of leaves and small branches, or anything else that might need to be done such as pruning a branch that broke in the storm.